Epson WorkForce 320 uses the Epson Micro Piezo system for its inkjet technology. The ink compatible with the unit is of Epson DURABrite Ultra type. The unit uses color management features such as Windows Image Color Management (ICM), Epson Vivid Color, and Adobe RGB. During sleep mode, the unit consumes about 0.2 watt of power while during operation it consumes 10 watt. The printer has a maximum printing resolution of 5760 x 1440 dpi for both color and black and white. Its printing speed is 4.3 pages per minute for black and white and 2.2 page per minute for color. Epson WorkForce 320 connects through an interface of 1 USB 2.0 port. It is compatible with MS Windows XP, MS Windows 7, Apple Mac OS X 10.6.x, Apple Mac OS X 10.4.11, Apple Mac OS X 10.5.8, MS Windows Vista, as well as MS Windows XP 64 bit Edition. 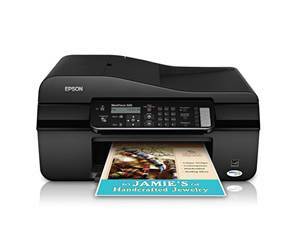 Epson WorkForce 320 comes out of the box with software such as Epson Easy Photo Print, EPSON Scan, drivers and utilities, and ABBYY FineReader. It emits 38 dBA of noise during operation and works at minimum temperature of 50 degree F and maximum of 95 degree F. Compatible humidity range is between 20 and 80%.